The tablet market is still growing. Q3 2013 saw 47.6 million units ship worldwide, up from 34.8 million the same quarter last year. Apple’s iPad once again took first place, although it dropped to 29.6 percent market share, while Samsung grew its share to 20.4 percent to keep second place. The other three players in the top five also all grew: Asus kept its third place position by grabbing 7.4 percent, Lenovo jumped to 4.8 percent to take fourth, and Acer took fifth with 2.5 percent. Amazon notably fell out of the list. 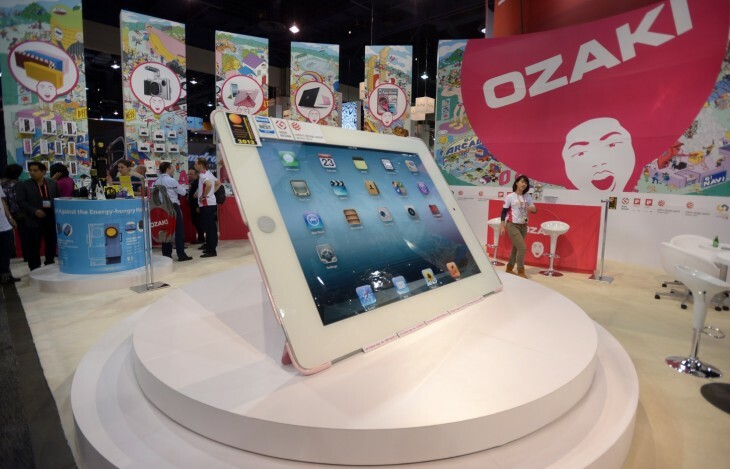 IDC attributes Apple’s share losses to no new iPad product launches in the second or third quarter, causing it to “only” ship 14.1 million tablets in the quarter. Year-over-year, iPad shipments thus grew less than 1 percent. Apple’s slowing growth was mainly caused by its decision in late 2012 to move its tablet launches from earlier in the year to the fourth quarter. That being said, now that the iPad Air and the iPad mini with Retina have been announced, the holiday quarter will be the real test for Apple. 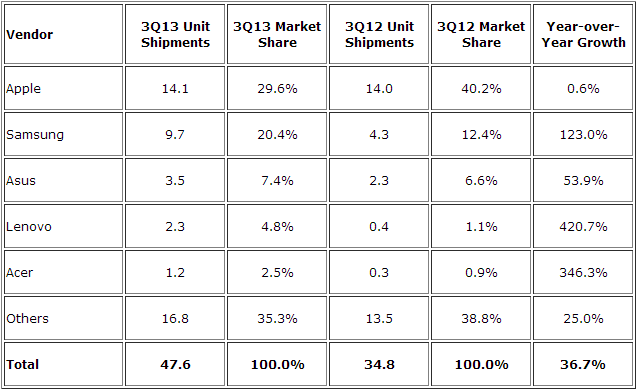 On the Android side, Samsung once again secured the second position with shipments of about 9.7 million units. Asus shipped about 3.5 million total units during the quarter, largely thanks to the Nexus 7 it makes for Google. Lenovo shipped 2.3 million units and Acer rounded out the top five with 1.2 million units. Major and minor vendors from outside the top five were responsible for over one third of the shipments in the quarter. Notable ones in the “Others” category include Amazon, Microsoft, HP, and Dell.